Last April, Universal Studios Home Entertainment invited us to the set of the Western Dead in Tombstone, although sadly we were not able to attend. Thankfully, due to the power of email and video cameras, we were able to submit our questions to stars Danny Trejo, Anthony Michael Hall and Dina Meyer, and you can see what they had to say while in the midst of shooting this supernatural action thriller. 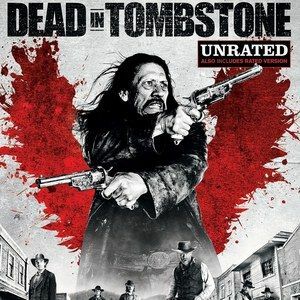 Directed by Roel Reiné (12 Rounds 2: Reloaded, Death Race 3: Inferno), Dead in Tombstone follows an outlaw (Danny Trejo) who makes a deal with the devil himself after his death, allowing him to rise from the grave and seek the revenge he so desperately needs. Take a look at our exclusive interviews with the cast of Dead in Tombstone, debuting on Blu-ray and DVD October 22, and you can also take a look at five behind-the-scenes videos. Danny Trejo (Machete), Anthony Michael Hall (The Dark Knight) and Oscar nominee Mickey Rourke (The Wrestler) star in this fiery, action-packed battle for vengeance. As a ruthless gang overruns a small mining town, they murder their own leader, Guerrero Hernandez (Trejo), in a cold-blooded power grab. Sentenced to eternity in hell, Guerrero finds himself confronted by Satan himself (Rourke), offering a daring proposition: deliver the six souls of his former gang and he will escape damnation. With time running out, he sets out on a brutal rampage to avenge his own death.